^ Share, David L. (2017). "Learning to Read Hebrew". In Verhoeven, Ludo; Perfetti, Charles. Learning to Read Across Languages and Writing Systems. Cambridge: Cambridge University Press. p. 156. ISBN 9781107095885. Retrieved 1 November 2017. ^ William M. Schniedewind (2006). Seth L. Sanders, ed. 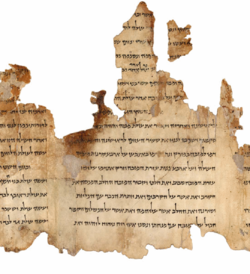 Aramaic, the Death of Written Hebrew, and Language Shift in the Persian Period (PDF). Margins of Writing, Origins of Cultures. University of Chicago. pp. 137–147. ISBN 1-885923-39-2. ^ "1577 The First Printing Press in the Middle East - Safed - Center for Online Judaic Studies". 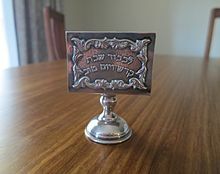 Center for Online Judaic Studies. 2017-09-07. Retrieved 2018-08-03. ^ "Keeping Hebrew Israel's living language – Israel Culture, Ynetnews". Ynetnews.com. 2013-01-17. Retrieved 25 April 2013. 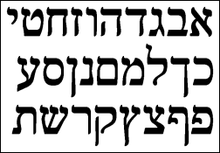 ^ "Basic Word Order in the Biblical Hebrew Verbal Clause, Part 6 | Ancient Hebrew Grammar". Ancienthebrewgrammar.wordpress.com. 2011-05-24. Retrieved 25 April 2013.